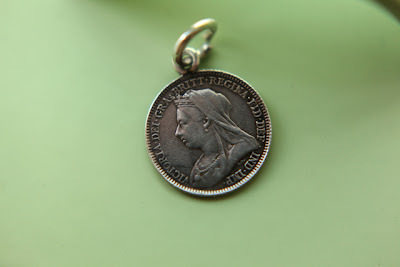 Love tokens were used as a way of commemorating a loved one and for those of limited means were a way of doing so at a much smaller cost than creating a bespoke piece since there were coins in circulation to suit every budget. Some were engraved by the giver themselves and others by a jeweller, some were simple and some very ornate or set with a gemstone. Earlier pieces are engraved across existing detail on the coin but later tokens like this one on a Victorian coin had one faced erased entirely in order for the personal message to replace it. Engraved tokens were commonly given as gifts between sweethearts, family members or close friends from the 17th century until they began to fall out of fashion in the 1920s, there were many made by soldiers in the trenches during World War One for someone special back home. It would not be unusual for entire bracelets to be worn containing tokens for every family member and loved one. 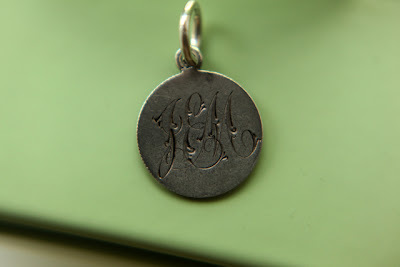 The initials on this token, J E M, spell out my name and it was given as a gift by a close friend, it is lovely to think by wearing it I am carrying a little piece of tradition with me. Such beautiful treasures you show in your blog! What a lovely idea to have that kind of bracelet! That's amazing! You're so lucky to have someone buy something so wonderful for you, it really is absolutely beautiful. It looks like it holds a lot of rustic charm. I love it! Thank you so much for another history lesson! I was never what you would call a history "buff" until I started antiquing. Now, I just love to hear the back story of these types of items. I know monogramed pendants recently became popular again, which only proves that everything comes back in style eventually - lol! I love the romantic story behind them as well. You are very fortunate to have one - and with your own initials! Second comment on the same post but I second Heirloom Gypsy, it's so nice to get a little history to go with the beautiful pics, my only criticism of this blog would be that there aren't enough posts! Oh, I never knew. How lovely. And how sweet of your friend! Thanks for sharing. I love these. Wish I saw more of these around. What a great gift idea! wow, I didnt even know these existed, and they're gorgeously romantic...I think they're now going to be part of my ultimate romantic ideal....why is it that we dont do gestures like these anymore? I'd choose these and leather bound books over diamonds and ipads any day!